The Griessnockerl Soup (or Griessnockerlsuppe in German) is a German soup that makes a perfect starter for a menu. 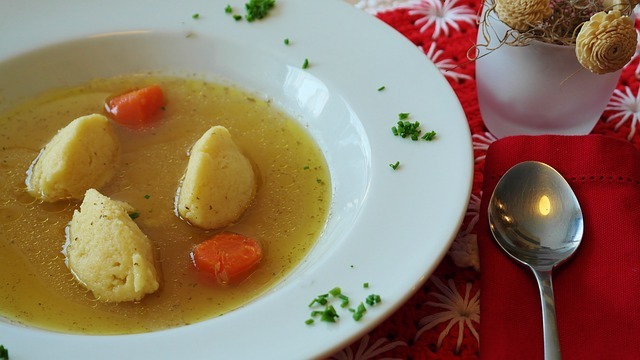 In Germany soups are served before a menu and the Griessnockerlsuppe is a classic soup that you can find on many traditional German restaurant menus. Nockerl are semolina dumplings and the origin is Austria. The Nockerl are very popular in Southern Germany and Bavaria and are served usually in a beef broth. Alternatively a vegetable broth may work as well. Happy Cooking! - Wash bones and meat under cold water and pat dry with kitchen paper. - Add about 2 l cold water in a big pot, place meat and bones into water, add bay leave, pin cloves into the onion and add to broth, and pepper corns. Bring to a boil then reduce heat, let simmer for 1 hours (not covered). Take off the foam that appears at the surface. - Add the chopped greens and let simmer for another hour. - Add soft butter to the semolina and mix well; beat eggs and add to the semolina until you get a smooth dough, add chopped parsley, spice to taste with salt and nutmeg. - When the broth is done, sieve it and bring back into the pot, spice with salt, nutmeg and black pepper to taste. Have the broth on low heat, it should be hot but not boiling. - With 2 teaspoons form Nockerl out of the semolina dough and place them carefully into the broth. It should not boil. Let them cook for 15 min and make sure the broth is not boiling. The Nockerl will fall apart otherwise. Before serving sprinkle the broth with some fresh chopped parsley. You also can use the carrots by slicing them and add to the broth (if they are not too soft).